Terrorist who murdered Binyamin and Talia Kahane is going free, but Kahane supporters have put a price on his head. On December 31, 2000, terrorist Mustafa Muslimani murdered Binyamin and Talia Kahane. Today, he is free as part of the Shalit deal, but friends and supporters of Kahane have put a price on his head. 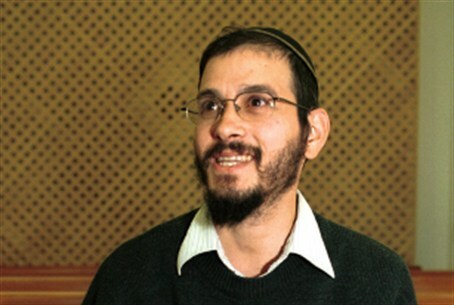 Binyamin Kahane was the son of slain nationalist leader Rabbi Meir Kahane and a leader in his own right. He was gunned down along with his wife, Talia, as they drove in their family car from Jerusalem toward their home in Kfar Tapuach. Five of their children were wounded in the ambush. Friends of the slain couple and supporters of the Kahane family's ideological path held a meeting in Hevron Sunday, and decided to hunt down Muslimani. The meeting included former donors to Rabbi Meir Kahane and to Binyamin Kahane, as well as former Jewish Defense League and Kach members. It was decided to set aside an initial sum of $100,000 to be paid to whoever kills Muslimani. Whoever kills Muslimani will have to submit a request to nationalist activist Baruch Marzel, who will serve as judge and decide whether the person does indeed deserve the prize. A participant in the meeting said, "The situation is what led us to make this decision. The government of Israel leaves people no choice and we have to lift the law up from the ground." Binyamin Netanyahu "is leading to anarchy," he said. "It is enough to look at the list of names of those going free to understand that the government of Israel has fallen on its head. Rabbi Kahane always taught us that 'in the place where there are no men, try to be a man' [a famous saying from Pirkei Avot – Ed.] and we are loyal to his legacy." The initiator of the meeting noted that there is a Halakhic rule that says a Jewish person must defend other Jews' lives and if he is unable to do so himself, he must hire another person to do so.